The company I work for, Birth Boot Camp, recently launched a doula program. I am not certifying to become a doula with Birth Boot Camp (yet), but I figured it would be good to check out the doula reading list. Amanda Devereux and Maria Pokluda put it together and had some interesting choices. They didn't just include the typical birth support books but added a book specifically about women in business. 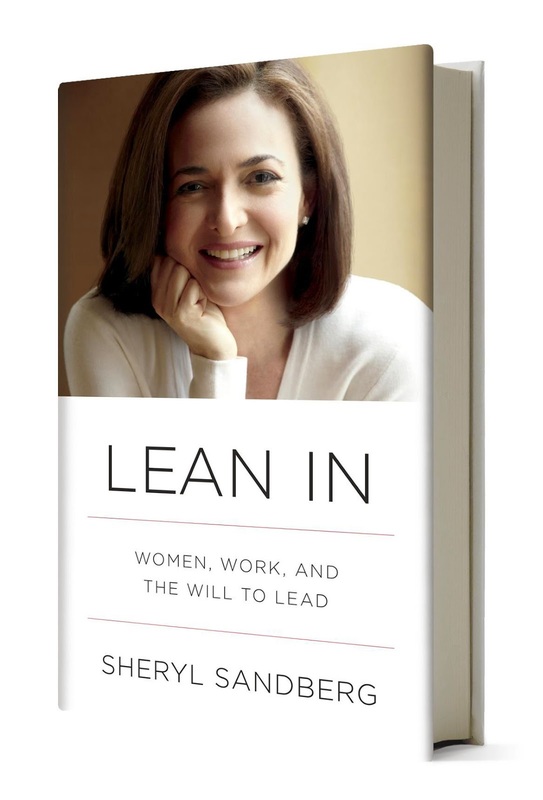 Titled, "Lean In," and written by Sheryl Sandberg, I had never heard of it, but was curious. I finally have a "fancy" phone and so I ordered it on Audible. I spent the next week listening to "Lean In," on my walks or whenever I had a chance. I mention that because listening to a book is slightly different than reading it, especially when the voice over is not the author. It gives the author a voice that might not sound exactly how I would have pictured it otherwise. I have to admit that I didn't care for the first chapter. In fact, I almost just stopped listening because it was really not the way I wanted to spend my free time. It just sounded like all the old complaints I have heard a thousand times about women not getting ahead and about equality and history and sad family stories about how hard life is on women. There was also a lot of stuff about "bossy" girls and how we shouldn't call girls bossy. As a mom of four kids, one boy and three girls, I can unequivocally say that both boys and girls can be bossy and it is equally annoying no matter the gender. It tend to just call a spade a spade. If somebody is bossy then they are bossy. And there is a difference between bossy and assertive. Assertive isn't annoying and rude, bossy is. Assertive stands up for what they know is right, shows leadership, and takes responsibility and works- all traits I try to promote in all four of my children. I probably call my son bossy far more than my girls (though not often, don't shoot me). Truthfully, I really dislike the "no more bossy" campaign. I also don't believe for a second that it is OK for anybody to be bossy whether they have a pecker or a set of breasts. Gag- just stop it. I didn't even KNOW this was a thing that was just said to girls before the campaign began. Anyhow, but then I got into the book. You know what- it was one of the best books I have read in a while. I normally fill my mind with birth books and murder mysteries- real deep stuff. I can't remember the last time I read something that could be dubbed "self-help," but I really enjoyed most of what was said in "Lean In". I have realized in the last year that I am shockingly a "working mother." I don't know why but I felt somewhat ashamed when I was "just" a housewife and now I feel somewhat ashamed at the work I do for pay, even though it is almost entirely in my own home. (I work from home part time and travel five or six times a year for trainings and other events.) I manage to feel not good enough in all my endeavors despite the overpowering love I have for serving my family and the deep passion I have for the work I do trying to improve birth through education. Talking about this honestly and openly was something that the author, Sheryl Sandberg, did in "Lean In" that was very eye opening for me. What is up with women, myself included, being so hard on ourselves because we have to make choices in our lives? Obviously if we want or need to work some sacrifices will need to be made in our home. The opposite is also true. Priorities must be made and hard choices will be involved. Why do we feel so bad about it and so guilty no matter what we do? Her chapters about figuring out how to make this whole "balance" work were so helpful to me. Sheryl Sandberg talked about the realities of life- that things have to give sometimes but that isn't always a bad thing. It helped me schedule myself better with my own work. I have a tendency to never turn it off or set aside my computer or my phone. Because I do work from home it is easy to work all day long at the expense of my children and my husband. My desire to do well at my work sometimes trumps my long vision and what is best for our entire family. Hearing Sandberg's words helped me organize things better and work more efficiently while making time for my family. It helped me see that if the powerhouse woman helping lead Facebook can focus just on her family over the weekend, then certainly, I can too. This was actually a revelation. My life is literally better now. Sandberg's talk about "coming to the table" and how women often dismiss themselves from the conversation in an effort to be...demure? !...was eye opening. Her talk about working hard and fighting hard for the best job and the best pay is so incredibly important. This in particular is why I believe the genius women behind Birth Boot Camp DOULA chose this book for every single doula to read. If you truly understand the WORTH of what you do and refuse to give it away, then you can be a powerhouse in your own business. Women need to start valuing their work no matter where they do it and no matter what they do. I have to admit, the fact that many women lack confidence and the self assurance to expect profit from their labors is a HUGE hindrance for all women. This is especially applicable in the birth world with many birth workers giving away their labors or sorely under valuing them in an effort to serve all women. They do this at the expense of their own families and the value of birth work in general. In fact, there is often spite directed at women who charge and apologizes issued from women who dare charge for their work. Sandberg's discussion about how women who do achieve are often looked down upon or viewed as bossy or "bit#$y" is sadly so true. We see that a lot in birth work too. I think sometimes people are threatened by someone who seems able to accomplish what they haven't. This tends to explain the "mommy wars" too, doesn't it? Why do we care so much if somebody does something differently than us? Why do we feel like failures if another woman has tighter abs or a cleaner floor or a higher paying job? Why do we then lash out at them rather than just appreciate their time and talents? There was lots more to the book. I loved and appreciated her focus on real things that we can each personally do to improve our standing and our value. Some of it was more applicable to women seeking to climb the ladder in corporate America than me. I will admit that I didn't agree with every sentiment in the book. Sandburg seems to feel that men are just as capable of staying at home and raising children as women are. And while I have to admit that it would be much more likely that we achieve true equality economically if more men stayed at home or more women worked, I don't view that as an ideal. I am politically incorrect and incredibly old fashioned in my belief that women are divinely designed to be nurturing mothers and should be providing a lot of care for young children. But you can't really say things like that out loud any more. Realistically though, she is right. We live in a capitalist society and worth is measured by money, usually money produced. While the work women do in the home is worthwhile, it doesn't directly produce income and so they are of no value in a society that measures value with dollar signs. I wish it was different, but it isn't. And don't worry guys, I think you are good at stuff too. Women are unique in our ability to grow and nurture children, but you are usually much better at arm wrestling. And that counts for something. If you are curious about the book, this TED talk from Sheryl Sandberg covers a bit of it. The book is much more in-depth an worth the time, but this will give you the basic idea. Great review! Amanda and I did pick this book for the Birth Boot Camp DOULA program for all the reasons you stated. Furthermore, a lot of her thoughts apply not to just the doula, but to expecting women as well. It is really cool how her thoughts are applicable for empowering a woman having a baby. Again, I never thought about this book as it relates to birth and birth workers in particular, but I appreciate connections you made there! Perhaps I am unique in that I think midwives should be paid MUCH more than they are!? If you break down their fee and look at their hourly wage... It's just not that much for someone providing such a valuable, skilled service! I read Lean In as well and at first I felt I couldn't relate because my aspirations have nothing to do with being successful at a big company. I just want to be the best wife and mom I can be, I want to grow my career as a writer, I want to run faster... etc. But then I saw Sandberg speak as at a conference I was truly impressed. We did a "lean in" small group discussion after her talk, based on the Lean In program she created, and I am not joking- it was life changing for me. Sandberg really is a firecracker and I am glad I read the book. Awesome Pam. Thanks for commenting. And thank you Maria for putting it on the reading list. Apparently I live in a cave, but I never would have read it otherwise.